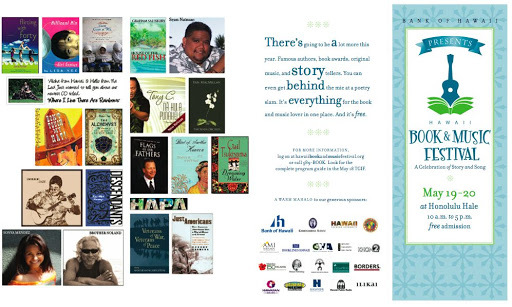 The Second Annual Hawaii Book and Music Festival is this weekend, May 19-20 from 10am – 6pm on the grounds of Honolulu Hale. 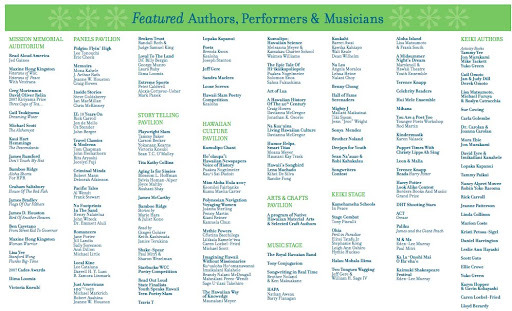 This free event features 150 performances, presentations, demonstrations, signings and other events by over 350 celebrated local, national and international authors, poets, storytellers, playwrights, crafters, songwriters, composers, arrangers and musicians. I will be there all weekend–emceeing sessions with Kaui Hart Hemmings (The Descendants/Random House), James Houston (Bird of Another Heaven / Knopf), Graham Salisbury, and Ian MacMillan and Chris McKinney sounding off about whether to publish locally or nationally (something I’ve been considering in depth as I try to find a home for my first novel). It’s important to support books and ideas, especially as they continue to disappear from national public discussion (i.e. : the slashing of book review sections across the country). Plus, you’ll get to see, hear and perhaps meet many of the authors whose work you admire. I’ll see you there.